Hi there. Welcome back to another great challenge here at Sweet Stamps. I had my Christmas in July card all ready to blog and guess what..I got to learn a new technique and have some fun playing. You will too if you try this Dryer Sheet technique. I used Mr. and Mrs. Snowman stamp set, but only used Mrs. Snowman to make the card. I used my BIC Markers to color in the image. I then cut it out using my Cuttlebug and the Oval Nestabilities Classics and Scallops. When I asked my husband to hand me one of the dryer sheets out of the basket where I keep them for dust rags, he looked at me like I was a whackadoodle. He saw what I was doing and really thought I had lost my mind. After he saw the finished product he was pretty impressed. I have some Therm O Web double sided adhesive sheets that I used to attach the dryer sheet. It made the process so easy. I matted the image onto a die cut scalloped oval using DCWV Christmas Card stock Pack from a few years ago. It's heavy decorative paper so it works well for mats. I stamped both the image and the sentiment onto Gina K Heavy Base weight Ivory card stock and inked around the edges with DI Vintage Photo before adhering them to the mats. The note sheet DP is from the new The Paper Studio Old World Christmas stack and the background DP is from the same DCWV stack. I ran the BG DP through my Cuttlebug using a Chevron EF. That bright ribbon is from stash from who knows how long ago. I hope that y'all will try this neat technique and enter a card into this challenge. You just might be a winner! Very cool! I LOVE how you used the dryer sheet. Last week I saw a challenge for dryer sheet flowers and until then I had never thought of using them on a card. Terrific card! What a beautiful design, I love how Mrs Snow looks using this technique. Love the embossing on the DP as well as the note sheet and the ribbon is awesome. 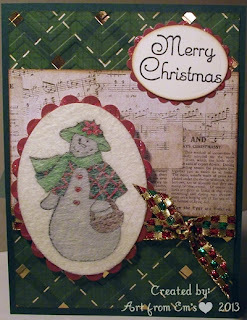 Thanks for being a guest designer this week at SweetStamps.com. Lovely design!! Love how you used your dryer sheet!! UV Resin Butterfly Pendant Video!